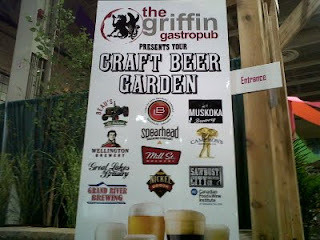 Friday, August 19th was the first day of the 2011 Canadian National Exhibition and for the first time ever, in the 132 year history of the event, there was a full battery of Ontario Craft Breweries on hand to help kick off the massive 18 day festival. In total there were 25 craft beers available from 11 different Ontario Craft Breweries, not a bad sampling menu if I don't mind saying so myself! And along for the ride was the Great Weiss North, the first collaboration between Sawdust City Brewing Co. and the Niagara College Teaching Brewery. 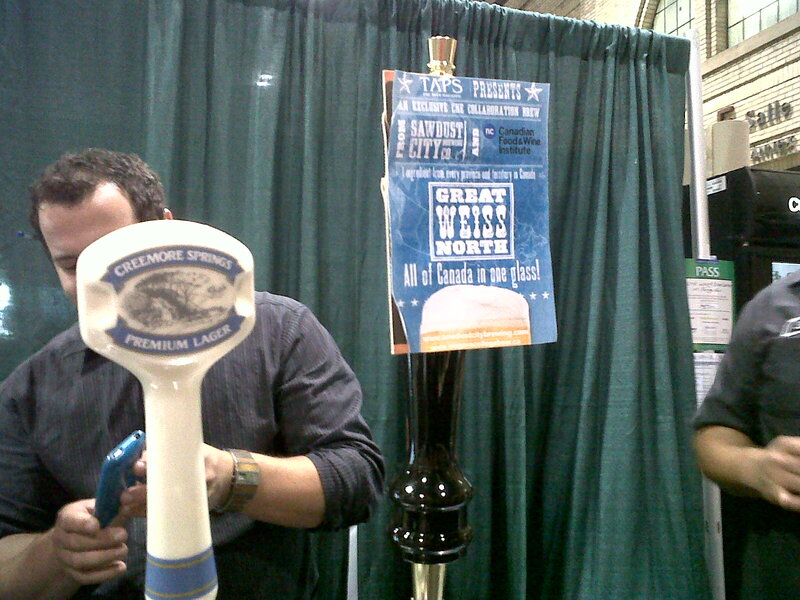 In one beer we were exhibiting all of Canada at the Canadian National Exhibition. 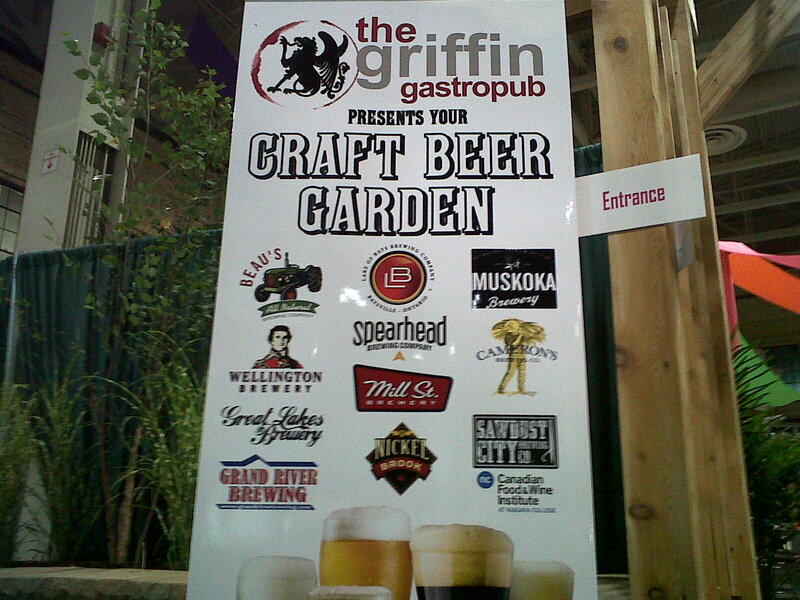 Check out the bottom right corner of this here sign out side the Craft Beer and Wine Garden (hosted by Jed and Curt of The Griffin Gastropub), yep that's our logo...pretty sweet. Now this next picture is pretty much craft beer personified. Being that we are relatively new and this was our first collaborative release, we didn't have tap handles that we could use, so instead we used good ol' fashioned McGyver-ing to come up with a make-shift, D.I.Y tap handle. The lads from Spearhead (a fine lot if there ever was one) kindly donated one of their extra handles and I cobbled together, with the help of some tape, a Wellington beermat and a hand cut version of our poster this lovely rendition of a tap handle...pretty sweet. The tap handle may have been a little suspect, but the beer pouring out of said tap was just fine in my humble opinion. 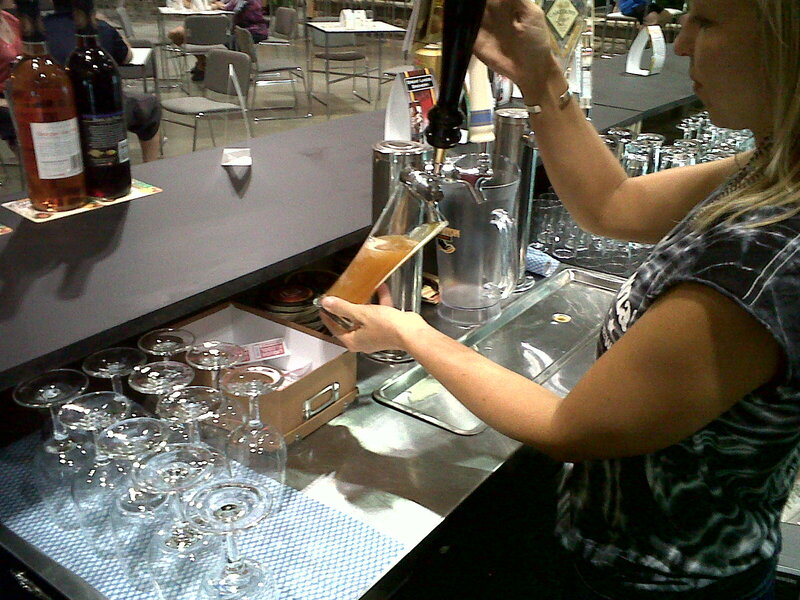 Check out this shot of one of the first pints ever poured of the Great Weiss North....pretty sweet. 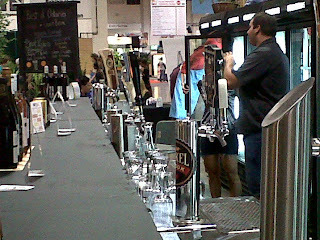 But I don't want to hog the spotlight here (even though this is my blog and I guess I have free reign to hog, but that's not what were about here in Sawdust City) there were a lot of other great breweries on hand to help celebrate craft beers first foray into the CNE. It certainly made it hard to just hand out beer and not sample it, but I'm a professional people and I kept it on the straight and narrow. Well for the most part, we still had the occasional break and with some fantastic grilled cheese sandwiches from the Leslieville Cheese Market, I made the most of it taking a seat in the beer garden and did a little quality control....pretty sweet. And along with a great number of breweries, were a great number of visitors and willing samplers. 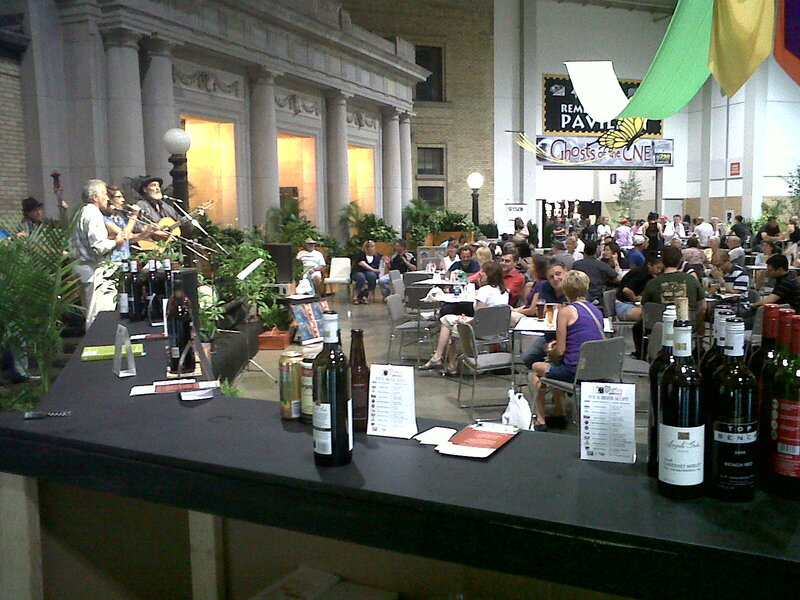 Some came for the wine, some came the fantastic music but just as many came for the beer. It was great to hear people say that they may not of heard of the breweries but were willing to give it a try. And with such a great stable of breweries, we certainly did make some converts. Many of which tried the Great Weiss North and for the most part it was a positive response. Over the first three days I only had one person not finish the glass...pretty sweet. All and all the first weekend at the Ex was a success, not only for Sawdust City and the Great Weiss North, but for Ontario Craft Beer in general. There were a lot of smiling faces in the beer garden and it was great to have so many new converts jump on the craft beer bandwagon. And with 15 days left I think the bandwagon may get a little overloaded...pretty sweet. Anyhoo, that's about it for now. Until next time, keep the beer in your mugs and the sawdust under your feet.